I travelled with my family (three couples and 1 child) in the last week of September. I thought the hotel rooms were ok by Greek standards. Living space was quite big but the bathroom and toilet were tiny with no window. Towels changed once during one week stay beds changed once. The staff and owners at the hotel were very friendly and genuine and the bar prices were reasonable but pricier than resort centre, as you would expect. The bar and pool area were nice and clean and seemed reasonably safe for children. As other posts have mentioned the hotel is set back from the centre which has its pros and cons. It was nice to be away from the noise but not so nice to walk through the littered streets and dirty subway to get to beach or resort centre. The main issue I had with the hotel was that they put two girls in a room in a block full of families and pensioners. This led to a daily wake up call at 5am when they would roll back from Malia with new men in tow. The rep received numerous complaints about them from different guests. I was not a big fan of Stalis and found it a little dirty and run down in look, however there were plenty of nice restaurants servings a wide range of international food. The beach was rammed with sun loungers with very little space between them. We hired cars for the middle three days of the week and found the east of the island (Elounda) to be more picturesque and less touristy. We also drove to the Aqua Park (20 euros each) where there were plenty of slides and rides which were all good fun. We hired the cars from a company called Caravel on the main street in Stalis. Although they look professional compared with other companies I found their working practices very shady. They told me the insurance they provided gave me a 100% cover and then when I had paid a deposit told me theft cover was not included. They then stated that someone could easily take a wing mirror off the car during the night at the hotel and that I would then have to pay a premium (almost hinting that it would happen if I did not take the cover out). They then supplied a very tired and worn out Nissan Micra which sounded like a World War II Spitfire! I would avoid this company at all costs. After reading the report in Holiday-Truth, we booked this apartment as we like to be outside the resort, but close enough to walk in to it, also the bit about it being for the older clientele suited us. Unfortunately, the age groups have changed, there were groups of single boys and girls there, so the order of the day was loud dance music played from when the Greek language sport finished on the television, till the early hours, when they would then go of to Stalis or Malia, before returning for the nightly door banging contest. The Sunday night barbecue was average, but again the music going on until 3am was a bit much. Having said this, we did overhear Van say to the rep that they should either send them singles or couples, as it is very hard to cater for both. Van and his wife Effy were lovely, the food was nice, the room was adequate, but a very small bathroom with the obligatory dodgy Greek shower. The location was spot on for us, far enough away, but close enough to walk to the beach, etc. i have just returned from nikos appartments and what a great place to spend a fortnight.the appartments,pool area and bar were fantastic alough the bathroom very tiny. the staff van and effy made our holiday, nothing was too much trouble and we have made good friends with them.we will definatly return next year and cant wait. This was the second time we had stayed at the Nikos Apartments and the friendly reception from all staff was as good as when we were there before. Van and family try very hard to ensure that you have a good holiday. The rooms are getting slightly tired and are beginning to be in need of refurbishment. They are basic (as are most 3* are in Greece)but they could definately now do with a good lick of paint and renewal of at least some furniture. This was though only a small distraction from an otherwise very reasonable set of apartments. The location is great - a 5 - 10 minute walk only from the resort centre and far enough away to leave the noise and hustle and bustle behind in the evening. We did find those attracted to the Nikos to be the slightly more mature (not old!) and therefore little in the way of rowdy youngsters. Just what we wanted. We were slightly disappointed with the room cleaning this visit as this was only done twice in the first week (including the famous Greek toilet waste bin) but it did pick up during the secind week. Food at the bar (lunch and breakfast) was good and reasonable as were the drinks prices. All in all a very friendly accommodation which we would return to. The apartments are family run and situated within easy reach of Stalis beach and town centre via the small underpass a two minute walk away. As you sit by the pool the mountains surround you and the view is just breathtaking. The apartments are quite basic but contain everything you need, the maid service is excellent and frequent, although the bathroom is small and watch the shower - can easily flood the bathroom floor. The food at Nikos is excellent and the Sunday evening barbecue is a must, traditional Greek food, fantastic dancing - on the bar - and at midnight a dance around the fire by the pool before a midnight dip! Fantastic. The staff are extremely helpful and friendly and nothing is ever too much trouble. The pool is superb, heaven for both adult and child. Would recommend these apartments to anyone. We loved them so much we came back and instantly re-booked for next year. This was a last minute deal with Thomas Cook. 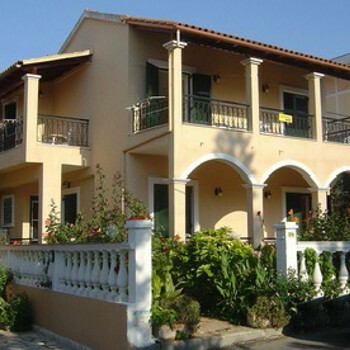 The Nikos Apartments are situated away from the very busy main road which you have to cross over or under to get to the next road then the beach. I would not recommend crossing over the road with young children as it's very busy and the drivers seem oblivious to pedestrians. Your only choice is using the underpasses but ours was full of water and mud and the next had no lights so it was a 500m walk to the next clean and dry well lit underpass. The apartment (No 21 ground floor) had a main open plan dining/kitchen area and separate main bedroom with patio doors and wooden shutters. Also in the main bedroom was a room safe (local charge). The bathroom was the usual all tiled affair with shower. We were self catering and we just and I mean just had enough equipment to self cater all apart from the absence of a chopping board. Then again we did get a coffee peculator and kettle. Air conditioning is available at a local charge. The location could not really be faulted there was no road noise from the very busy road or from other hotels and it had lovely views of the mountains in the distance. The gardens were well kept as was the pool/bar area. All staff were polite and very helpful especially the old man who tended the gardens he gave me a handful of apricots every morning. Summing up these are lovely well located, clean & spacious apartments with attentive polite staff. I first went to Crete in 1992 on my honeymoon, and we stayed at a then little small set of apartments named Niko's. We didn't know much about Greece or the resort we were staying and in fact being our very first holiday abroad we were at the mercy of the country and its people. We've been going back ever since almost every year hopefully that answers any questions you have. The family run apartments are well maintained and always very clean and if you have any problems don't be scared to ask either Vangelis or Niko's, in fact any of the family will be more than welcome to help you. It's a family place and the surroundings are beautiful and the food is great. They have a barbeque each week. Your just across the road from the local resort of Stalis where there's plenty to do and lots of places to eat out and good shops for the women of your party to have a browse around. The local beer is not to bad, you can get a good pint in a few places. Trail and error as we say. I would advise not to do the reps day trips out as they can be very expensive and would advice you to just walk down from Niko's to the main road and catch the local bus which costs nearly nothing. Get yourselves down to Aghios and when you arrive, there,s plenty of boat trips to all over the island for half the price the local rep will charge you. Trust me from experience you'll thank me when you do. You'll be sat on the boat saying, this is more like it and that blokes advice on the internet before we come out here was great. Local places to eat. I'd say Maria's and Gillini's just around the corner and if you fancy a little stroll up the beach road to Artemis on the left hand side past the little church, you won't regret it. Average meal for myself and wife and mother and daughter was 45 euros and a few drinks as well. Which wasn't too bad. I also suggest buy plenty of bottled water and go in the supermarkets and get your cordial and make drinks for yourself before you go out to the beach. It's also best to have a stroll down the beach and price up the sunbeds before you get yourself settled. Aar hire and motorbikes, same thing always shop around, hopefully this has helped in someway to making your decision to go to Stalis and Niko's apartments. Have a great holiday and just take your time, there's no rush.. oh just before a go try a local taxi up into the big mountain at the back of Niko's apartments, there's a little village up there called Maphos. Have fun .. god bless Mike.. Say hello to Vangelis for me..